Hanuman’s fruitful search for Sita, who represents not only material success but also spiritual peace and harmony, is a perfect example of how every person can achieve success in one's life. When Vanara sena looked across the shore, saw that 800 miles had to be crossed, they sat back, and thought about their limitations and inability to perform. They thought the feat to be impossible due to their failures in the past, or the fear of the future as to how they would face the situation in Lanka. None of them dared to take the leap. Hanuman’s single-mindedness towards his goal did not make him sit back but rather carry on with confidence taking the Name of the Lord. When the goal is noble one should set out for achieving it without any hesitation and one will recognize within oneself a source of infinite strength. 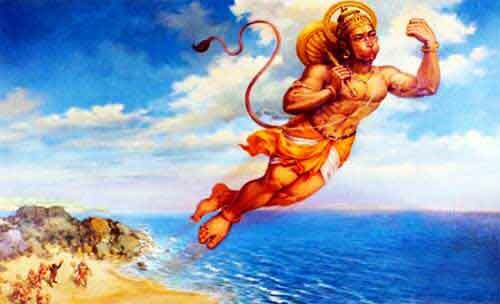 There were three obstacles that Lord Hanuman had to face in his journey towards success. First was the mighty mountain - Mynaka - not obstructing his way by strength, but rather by tempting him to rest for a while on his long and tiring journey. On any journey towards success, the greatest obstacle is the tendency to rest. Hanuman did not succumb to this temptation. As he proceeded further, he was met with another obstacle and that was Surasa who was out to test him. She wanted to swallow him up. Hanuman became big, Surasa opened her mouth bigger. This drama continued. Surasa represents greed. The more you satisfy greed the larger its mouth opens to devour. The only way to conquer greed is to keep our needs to the minimum. Hanuman became very small and came out of the devouring mouth of Surasa. The person who is on the path of success to achieve anything nobler and higher must keep his needs to the minimum. Then came on his way a unique obstacle and that was Simhika. Simhika had the power to pull and drag down anybody who went over and above her and, eventually, devour it. Hanuman killed her right away. Simhika represents that negative quality in our hearts known as jealousy. Jealousy in our hearts towards others, as well as jealousy invoked in the hearts of others by us, both are obstacles to our path towards success. All such negative tendencies in our bosom should be mercilessly destroyed just as Hanuman killed Simhika.